With the heavily damaged Corvette in the shop, the team had about six months to execute the remaining five phases of their multistep build schedule. The plan would take them from disassembly and cleaning through final testing and then down to Florida for the Challenge. Along the way, each team member had various tasks to keep the project on track. It took about six weeks just to get the car running and repaired well enough to obtain a title and registration. Once the wheel bearings, A and B pillars, windshield, lights, and jagged body were addressed, the project moved into the modification phase. 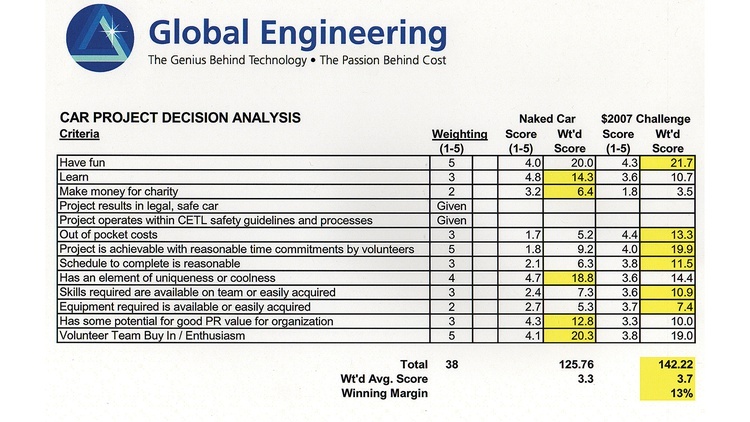 An untold fourth category—one that we see on a lot of Challenge cars—was to implement something that would make every team member chuckle a bit when they saw it. For Team Cheaparral, the idea came to them as they finished off a pony keg of Blue Moon Belgian White ale. Not coincidentally, that very same pony keg was under the knife in no time, and it would serve from that point forward as a fuel cell and a punch line for their creation. For power, the team was hoping to improve the peaky torque curve of their early injected C4 Corvette. 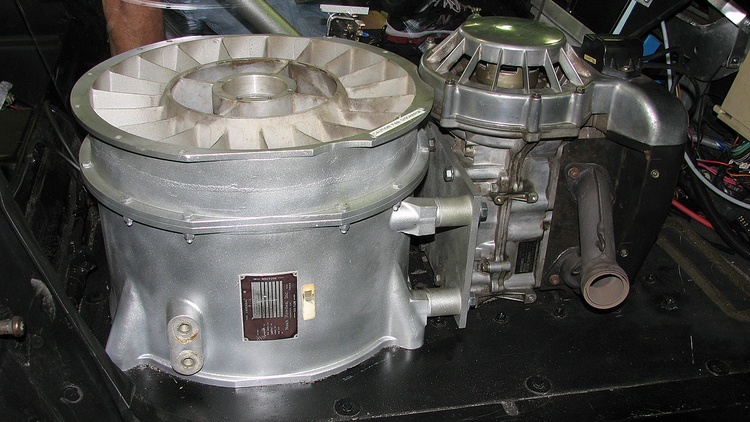 After going over a dozen engine options, the team settled on the relatively inexpensive but complex dual turbocharger option. “We picked the small Garrett T25 off Mitsubishis,” Stoyan explains. “They’re very cheap since everyone is trading them out for bigger ones. They were spinning up instantaneously—as soon as you hit the pedal they’re right there.” The turbos ended up costing just $71 for the pair. It took a bit of trial and error to get the oil pressure for the turbos just right, and in the process they fried one of the turbines, breaking its shaft in half. Fortunately, no fragments went into the engine, and they had plenty of time to source and install a replacement. The team made their own turnbuckle-adjustable wastegates and settled on 6 psi of boost. They figured this pressure was a tad risky considering the cast pistons, but still doable. They expected the setup to net them more than 300 horsepower on the stock internals at a low 4000 rpm redline. Torque from the big, turbocharged engine was not going to be a problem. Reducing the mass of the Corvette was fairly easy in comparison. The team did it the old-fashioned way, simply removing anything that wasn’t necessary for the competition. Since taking the car apart and cleaning everything was an early step in their plan, it was merely a matter of not putting the heavy bits back in. This allowed them to keep the competitive weight right around 3000 pounds in autocross trim, or 2800 pounds in drag trim. That 200-pound difference is the kicker. It accounts for the Cheaparral’s secret weapon, an ingenious, low-buck, vacuum-generated downforce assembly. “For the handling, we were looking at all the usual things, like suspension and ground effects,” Stoyan recalls. The team realized that they couldn’t generate enough speed at an autocross to make the usual aerodynamic aids worth their cost or complexity. “Then we thought, ‘Didn’t Chaparral do something with a blower?’” Stoyan recalls. “One of the engineers, Cliff [Papsdorf], started doing some calculations to get various g numbers. It looked like it was doable.” The team spent time modeling the airflow and then built a test mule for proof of concept. “We got some industrial blowers that we use for various machines, hooked up a five-foot-diameter blower with a 50-horsepower motor, and did some tests to see how close to the ground it had to be and what kind of force was needed,” he explains. “We knew it was feasible, but we had to figure out how to get it into a car.” Finding a compact but powerful blower within the allotted budget was the biggest difficulty the team faced. “We at one point thought about building our own blower, but as the leader I was saying, ‘No way in hell.’ The clock was ticking,” Stoyan recalls. They were a week away from giving up on the idea when Cliff, prowling the Internet late at night, found their solution in an unexpected place—the back of an M1 Abrams main battle tank. The blower was far from pristine, however. The team suspects it had seen duty in Desert Storm, as the unit was packed with sand and generally in rough shape. They polished the vanes, rebuilt the bearings and did their best to cope with galling on the shaft. Stoyan estimates that 20 man-hours went into refurbishing the blower. 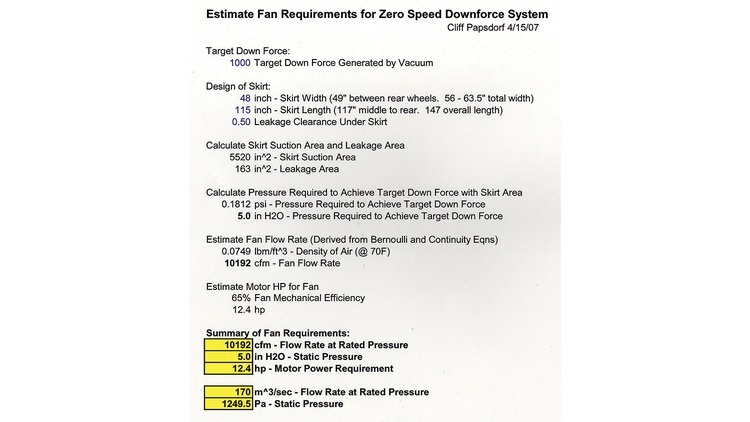 Using computer-aided design programs, Cliff and the others came up with plans for the under-car skirt design and how to mate the blower to a used snowmobile engine. The blower is fairly exotic, but the rest of the assembly is primarily made of plywood and off-the-shelf hardware, like casters. These more mundane elements had the important duty of keeping the whole assembly rolling and preventing it from sucking itself completely to the ground. In operation, the setup is surprisingly simple. A big square tray is attached to the bottom of the car with a simple suspension. 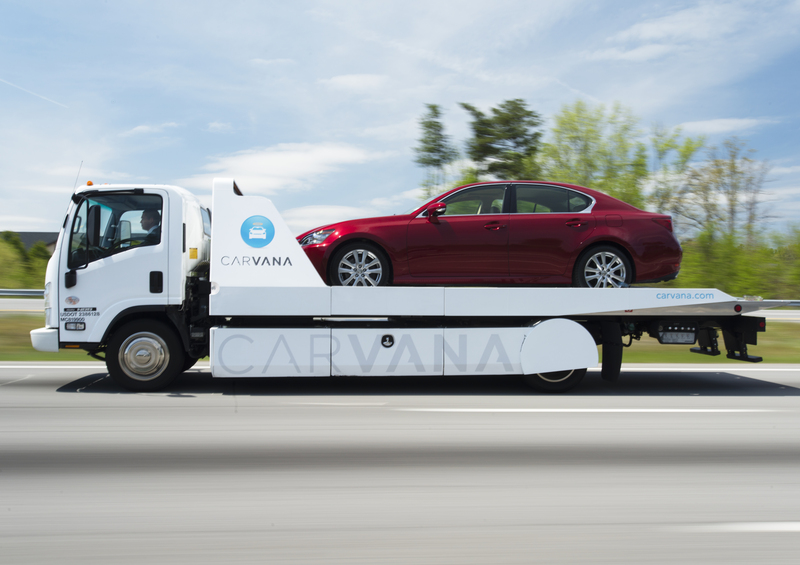 The tray rides on casters that keep it the right distance off the ground for the target vacuum, and a flexible skirt creates the airtight seal between the tray and the bottom of the Vette. When the blower is activated, air is sucked out of the tray’s cavity, creating a region of reduced pressure between the car and the ground. As a result of the vacuum, the underside of the car wants desperately to snug up to the asphalt. At an operational vacuum of 10.0 inches of water, the Cheaparral’s sucker design yields an awesome 1000 pounds of downforce with an inertial penalty of just 200 pounds of hardware. The whole system can be removed or installed at the track in about an hour. From the moment the Cheaparral rolled off the trailer and people realized what the undertray was for, the car was surrounded by Challengers poring over its secrets. The concours judges took note of the engineering genius, as well as the fit and finish of the build, and awarded it first place in the concours. And when the Vette pulled up to the line for its first autocross run, all ears perked up at the unmistakable high-pitched whine of the snowmobile engine driving the tank blower. A 30-foot tornado of sand and debris shot up from the passenger-side blower as driver Danny Popp muscled the Cheaparral to a 33.208-second time—good for fastest time of the day—on his very first run at the autocross. Unfortunately, a dash screw had shaken loose on the bumpy trailer ride down from Ohio and found its way into the throttle pedal pivot. This caused the throttle to stick, which botched the car’s second and third runs. The blower motor cut out on the final run, but the team had earned enough points to take the overall $2007 Challenge victory. Not surprisingly, the overall project’s six-phase time chart in Team Cheaparral’s build book already had small blocks of time set aside for a “victorious return” and “Corporate Engineering Technology Lab celebration” in the two days following the $2007 Challenge. Talk about sticking to the plan. 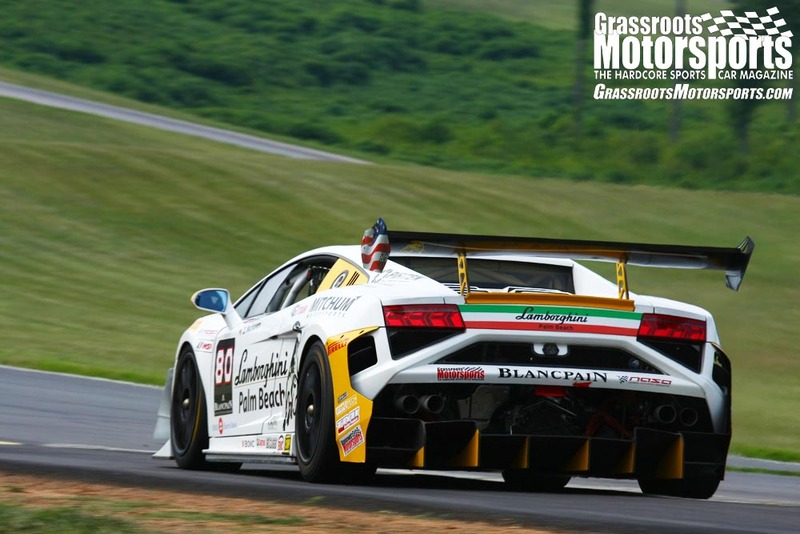 From the very start, Team Cheaparral wanted the end result of their project to benefit charity. To achieve this goal, they anticipated auctioning off the final result or selling it to a museum and giving the proceeds to a local cause. That’s still the eventual plan, but in the meantime their radical sucker Vette is going to be a teacher, too. If you’ve been reading GRM for a while, you’re probably familiar with the name Danny Popp. 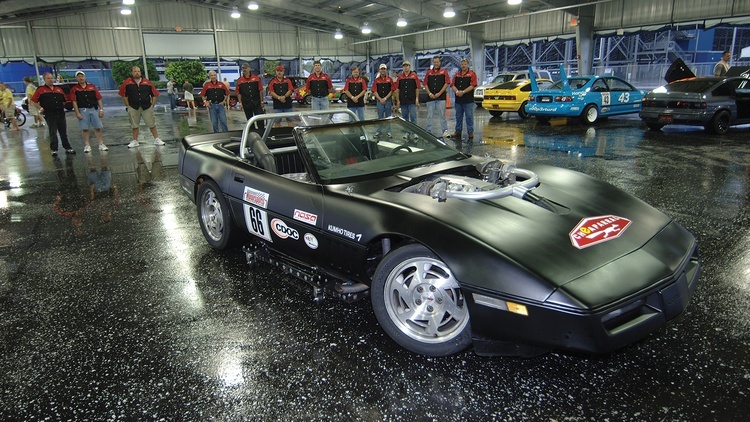 Back in June 2004 we featured his A Street Prepared-winning Z06 Corvette, and more recently Popp took a first in class and second overall—just behind Tommy Archer—in our 2007 Ultimate Track Car Challenge. 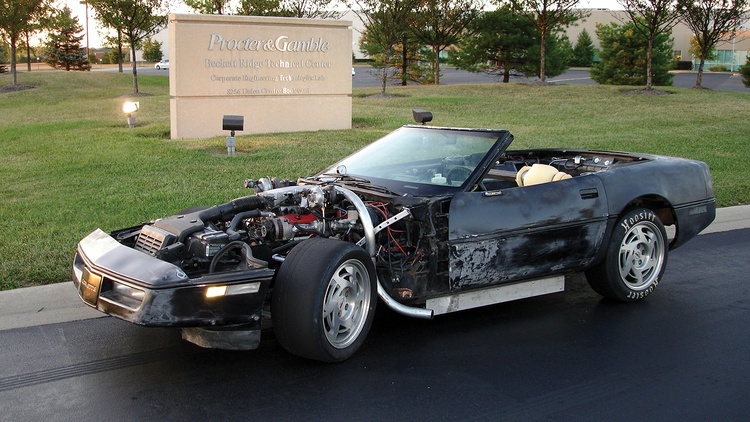 Popp was actually pondering the possibility of a C4 Corvette for a $200X Challenge when he was contacted by Cliff Papsdorf, one of the Cheaparral engineers, to consult on their own $2007 Challenge Corvette. When Cliff explained that they were going to attempt to make the Vette a sucker car like the Chaparral 2J, Danny decided they were a bunch of loons. What the system lacked in NVH comfort, it made up for in performance, cutting 1.5 seconds—about 10 percent—from the skidpad lap time. “Incredible. I’ve never seen anything like it,” Popp says. 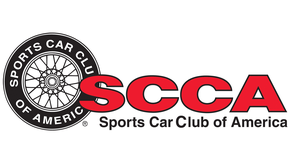 Three days later they set up a 30-second autocross course. “My dad brought his B Street Prepared Corvette over to baseline the car against—LT4, six-speed, 315s up front and 335s in the rear. Fast,” Danny explains. 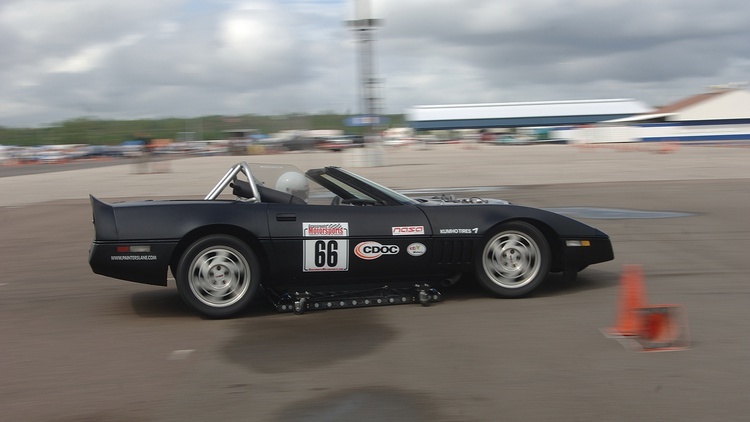 Without the sucker motor, the Cheaparral was about 1.6 seconds behind the BSP Vette. 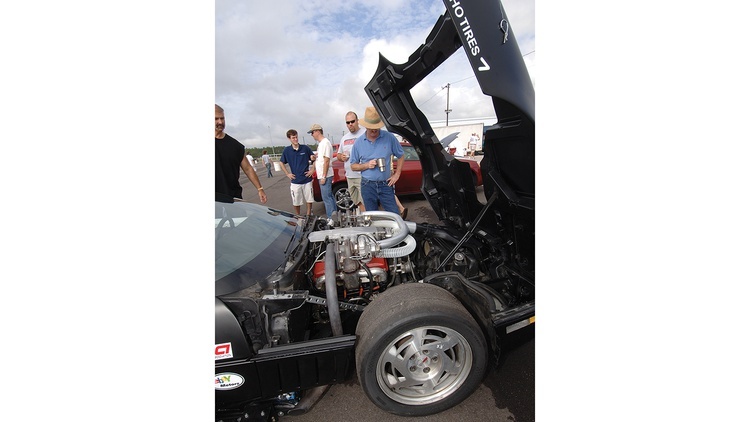 With the fan running, the Cheaparral bested the race car by 1.4 seconds, meaning the blower was worth about 3 seconds—10 percent—at the short autocross. So what’s it like to drive a vacuum-assisted twin-turbo Corvette? Popp insists that little snags like the loose screw in the throttle pedal prevented a demonstration of the Cheaparral’s true handling potential. “There was more—a lot more,” Popp assures us. 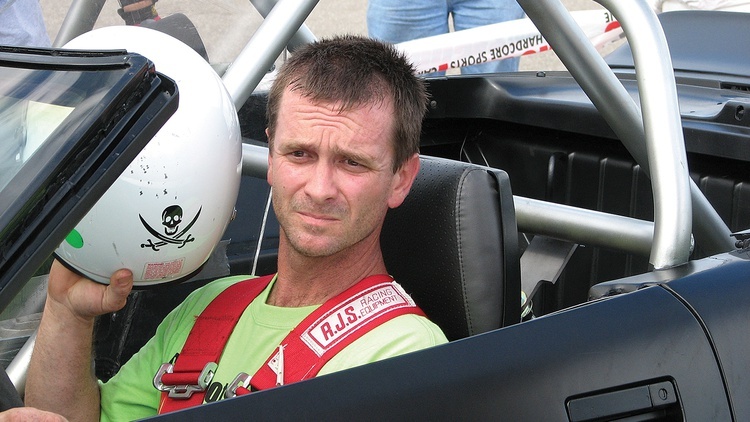 “At least two more seconds on the autocross course.” Considering Popp’s level of experience, the unusual grip level of the car and the fact that he set FTD on his first run, we’re inclined to believe him. “Maybe next year,” he grins.